The traditional quilt block “Union Square” was chosen for it's name and because it would have been a familiar pattern when the Union Cemetery was new and the war to preserve the union of the United States a recent memory. The church building was constructed by the Cove Associate Presbyterians in 1879 and was used until 1922 when the dwindling congregation merged with the United Presbyterians in McConnellsburg. Today's Presbyterians in Fulton County are descendants of the union of these two congregations along with earlier Seceders and Covenanters dating to the 1700s. However, the cemetery has always been non-denominational and available for use by all in the community. 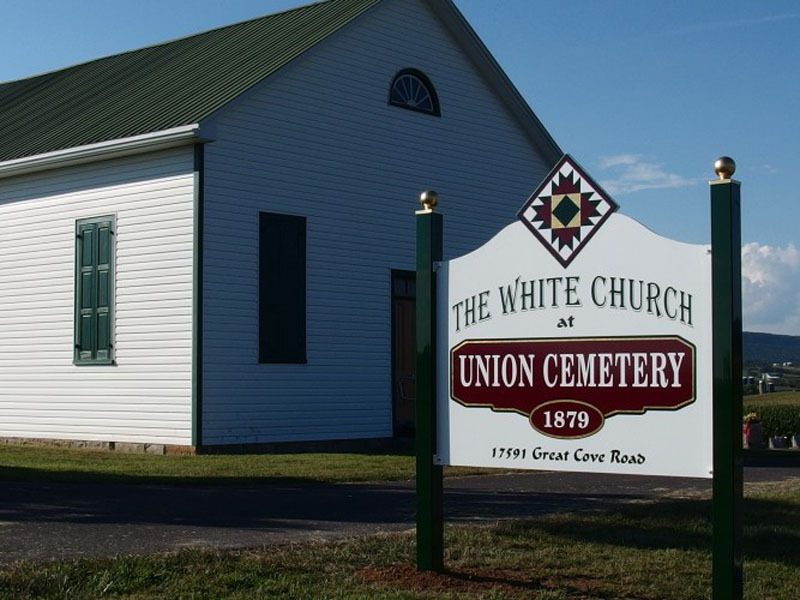 The church building has been restored and may be used for special events by contacting the Union Cemetery Association.